While most principles and tenets of design are pretty universal, printing is not. For anyone jumping to a different medium (online to print) or even one medium to another, it is vital to know just what you need and will get when working on a print job. Elements such as paper stock, paper size, coating and fold can significantly impact how a design is put together for a printed project. 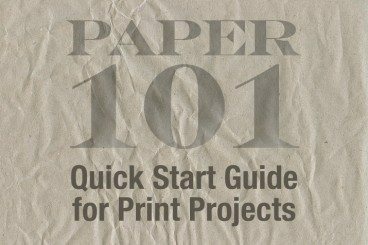 Here’s a guide to help you get started and better understand the ins and outs of printed projects. Before you even start designing, it is a good idea to know what exactly you are designing for. The type, color and weight of paper that will be used to print the final design will impact how some technical aspects of the work is completed. Paper with heavier weights is often used for projects that will be handled. Business cards and mailed postcards are often printed on heavier stocks than things such as letterhead, posters or booklets. In addition to durability, paper stock can have an impact on ink and color choices. You would not lay ink as heavy on a thin paper such as newsprint as you would for something like a glossy brochure on coated paper. Pound: The measure used to describe the weight of a 500-sheets of bond paper (17 inches by 22 inches). The paper is then cut into four letter-sized sheets. The higher the paper weight, the thicker the paper. For example, a common package of office paper is 500 sheets of 20# paper (meaning it weighs 5 pounds). ”A” Paper: In the metric system, paper is measured in square meters. The base measurement for A0 paper (1 square meter) is 841 millimeters by 1,189 millimeters. A1 paper is half of A0 and A2 is half of A1, and so on. Point: The actual thickness of an individual sheet of paper when measured with a micrometer. Thicker papers have higher point values. Cover: These are the thickest stocks, are typically rigid and not designed to be folded. Common uses for cover stock include business cards, publication covers and folders. When it comes to printing the size of your canvas is important as well. Something that looks great on a poster-sized page might not work on a business card. But what are the standards for these jobs? The international standard for paper size is used by most of the countries in the world, except the United States and Canada. ISO 216 is a metric format. A4: The most widely used size measures 210 millimeters by 297 millimeters (8.25 by 11.75 inches). Business card: While standard sizes can vary somewhat by country, the common size is 85 millimeters by 55 millimeters. C series: Paper that is most often used for mailing, such as postcards and envelopes, and folders. Post: Larger size paper that is 394 millimeters by 489 millimeters (15.5 by 19.25 inches). Letter: The standard paper size for most work, which measures 8.5 inches by 11 inches (215.9 by 279.4 millimeters). Legal: Paper that is longer and typically used for legal documentation and measures 8.5 inches by 14 inches (215.9 by 356 millimeters). Business card: The ANSI size is slightly different shape than the international standard at 3.5 inches by 2 inches (89 by 51 millimeters). Postcard: While these sizes can vary widely, a standard postcard mailer is 6 inches by 4.5 inches (152 x 114 millimeters). If you are looking for an extensive guide to paper sizes and specifications around the world, consider resources from The Print Handbook. When it comes to the finish of paper, there are two options coated or uncoated. Coated papers are typically glossier and brighter in appearance. They can have a more polished and professional appearance. Uncoated papers are commonly used for letterhead, printing and forms. Uncoated paper can be much easier to write on and handle. Paper coatings can by applied by a printer or finisher and there are a variety of coating options. When opting for coated paper the biggest choice is to pick between a liquid or film laminate. Liquid coatings are applied as part of the printing process or immediately after the project comes off the press. Coatings include varnish, aqueous and UV types. Varnish coatings add a finish of gloss, satin or dullness without coloring or tints and are relatively low-cost. Aqueous coating provides protection against damage from fingerprints and blemishes, making a paper more durable and are an affordable option. UV coating offers the most protection in a high gloss finish and can be applied over an entire document or in specific locations. Film laminate coatings are applied after the print job is finished and can be applied as wet or thermal finishes. This coating applies to the entirety of a document and can include color tints, textures and even holograms. Laminates can also be applied in varying thicknesses, depending on durability needs. The different laminate options include a full plastic jacket, polypropylene, polyester and nylon. When it comes to coatings, there are a variety of options and it is notable that they can be mix and matched. An all over coating could be paired with a different type of spot coating to create a unique effect. Finally, when thinking about how a job will be printed, consider how paper will be folded. Is it a brochure, tri-fold or something else? Do you want text and images to go across the fold or use fold lines as distinct section borders in the final product? The most common paper folds include a half (or four-page) fold, tri-fold (six pages), accordion and gate folds. Half-page fold: This type of fold is the very common “card-style” look. It is used for booklets and greeting cards. Tri-fold: This type of fold includes three panels on each side for six “pages.” Two panels are of equal size with one slightly large to allow for proper folding. It is a common style used for brochures. Accordion fold: This type of fold can include as many panels of equal size as you wish. It is a common style used for brochures. Gate fold: This type of fold can have three or more panels where the outside panels fold into the larger center panel. The fold creates a “window” effect and is a common style for announcements and invitations. Short fold: This type of fold can include two, three or more panels where the top of the paper is folded inside. The fold often leaves part of the paper behind it visible. While not as common as other fold types, it is used for brochures. Learn more about different fold specifications, including some less common folds, in the interactive guide from Printing Partners. Understanding paper is an important part of designing for print. It can be fun to look at paper types and a little scary too. Before starting on any printed project, request a sample kit from the printer so you can handle various paper types before you get started. Are you ready and geared up from a print project now? What are some of the obstacles you first faced when working on a print project? Let us know and if could turn into a future article. Image Sources: fsse8info, Antonio Bonanno, Sandra Schleter, Alpha, , Debs, orangefred>, fsse8info and orangefred3.